ABOVE: The Ca' Nigra Lagoon Resort and its gardens. INSET: Another view of the hotel, café tables along the water, and a room facing the Grand Canal. Location: On a small, quiet campo facing the Grand Canal, within walking distance of transportation to the mainland or cruise port. You want to be in the heart of historic Venice, yet only 5 or 10 minutes on foot from the main railroad station and the Piazzale Roma (where you can catch airport buses, cruise shuttle buses, taxis, and the People Mover tram to the port entrance or the Tronchetto parking garage). We love the Ca' Nigra's location, and we suspect that you will, too: it's on the Campo San Simeon Grande or Campo San Simeon Profeta (either name is correct), a small square where you can sit on a park bench and watch vaporetti, water taxis, barges, police boats, and other water traffic pass by at close range on the Grand Canal. 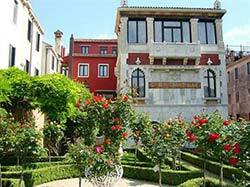 The hotel is as impressive as the square, or possibly more so: It's an 18th Century palazzo set in a large private garden where you can eat breakfast or simply relax by the Grand Canal. All of the stylish guest rooms are labeled "junior suites," and they're large by Venice standards. For information on how to reach the campo (with photos), see the step-by-step directions from the railroad station and directions from the Piazzale Roma in our Hotel Ai Due Fanali review. And if a room isn't available at the Ca' Nigra Lagoon Resort for the dates of your stay, see our page about the equally high-rated Hotel Canal Grande across the square. The top photo shows the railroad station, the Scalzi Bridge over the Grand Canal, and (near the right side of the frame) the small Campo San Simeon Grande. The Ca' Nigra Lagoon Resort is the narrow red-roofed building with a garden in front. The second photo shows the campo, the hotel gardens, and the hotel building (which is next to a smaller canal that feeds into the Grand Canal). The walking route to the hotel from the train station is fairly obvious, and--as you can see--the distance is short.